Spices: 1 tsp turmeric, 1 tsp chilli powder, 1 heaped tsp cumin, 1 heaped tsp coriander, 1 tsp salt and 1 tsp Patak’s Original Garam Massala Paste (found in all South Asian stores). 1. 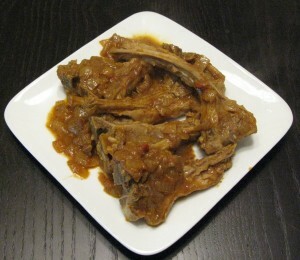 Wash and clean the lamb chops cutting off any excess fat, and then pat dry. If you want to drain off all the fat first, drop them in boiling water and remove after 5 minutes. 2. Dice the onion and garlic finely and keep separate. 3. In a pan, heat up 2 tablespoons of oil. Add the garlic and fry until almost brown taking care not to burn the garlic. 4. Add the diced onion and fry until almost brown. 5. Lower the heat and add all spices as above including the salt and fry for 2-3 minutes on medium to high heat. Add 1 cup of hot water (preferably from the kettle) to make a smooth paste. Turn up to a medium heat and let cook for 10 minutes. As the massala/sauce starts to dry up, add more water (1/2 cup to 1 cup). Basically, you want the consistency of the massala to be a thick sauce, rich in colour. 6. Add one chopped tomato and blend into the massala. Cook for a futher 2-3 minutes before adding the meat. 7. Turn the heat up high and add the chops. Cook the chops until they brown all over. Add water as necessary if you start to see the massala drying up. Then lower the heat and let simmer with the lid on for 7-10 minutes until the meat is tender and fully cooked. 8. Add 1 level tsp of Patak’s Garam Massala and stir into the massala/sauce. Cook on low for a further 2-3 minutes. 9. Remove from heat and sprinkle a generous amount of fresh chopped coriander leaves all over. Recommendations: Serve with hot rice of your choice and a side salad.